Despite an abundance of meat-free products already on the market that taste similar to animal meats, Scionti found that these are limited to imitation burgers, chicken nuggets or meatballs. None of the offerings reproduce a piece of "fibrous flesh" such as steak or chicken breast. In an effort to reduce the impact of animal agriculture and to improve people's nutrition, the Milanese researcher set out to create a plant-based alternative to "fleshy" meat products. By combining tissue engineering and bio-printing with modern cooking methods, he created a vegan product that boasts the same consistency, appearance and nutritional properties as animal meat products. 3D printing allowed the scientist to generate complex, micro-structured tridimensional forms that he says are impossible to achieve using other techniques. For his first prototype, Scionti mixed a limited amount of protein content with a paella colourant, resulting in a jelly-like substance with a strong red hue. He went on to develop a fake steak – as well as a plant-based chicken breast – with a higher protein concentration, and included specific ingredients like lipids, fibres, minerals and vitamins, to mimic the nutritional properties of animal meat. This version does not include any colourant, and therefore is a light brown colour, similar to ordinary cooked meat. Syringes containing the beige-coloured food paste were placed in a 3D printer, which followed a pre-set code designed by Scionti using computer-aided design (CAD) software, to print out the mixture in the shape of a small steak that can then be cooked. While there are some companies working on the creation of artificial meat from animal cells cultured in the labs, sometimes known as "clean meat", these methods take a long time to make and are expensive. 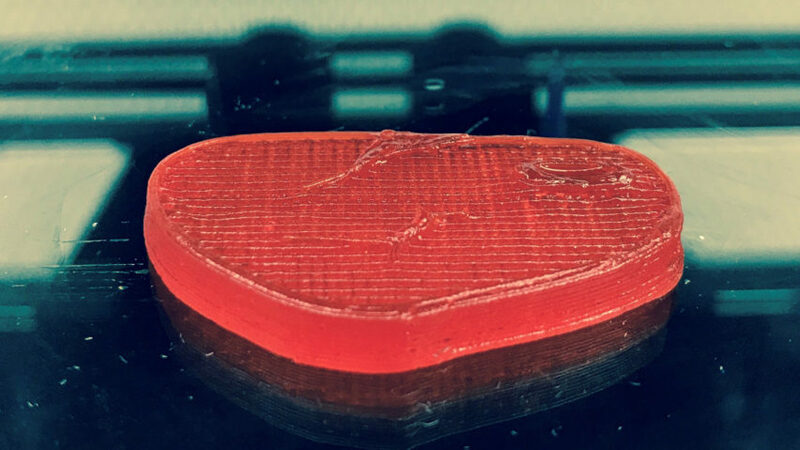 Scionti's method allows him to print a 100 gram piece of steak in around 30 minutes. For large-scale production, the bio-engineer predicts that the technology will be able to reduce time and manufacturing costs by ten times, compared with current values. In addition to creating an ethical meat alternative, Scionti designed the meat-free steak to help in reducing greenhouse gas emissions from livestock, which account for 14.5 per cent of the current total man-made greenhouse gas emissions. "The latest reports from the Food and Agriculture Organisation of the United Nations (FAO) show that the current large-scale livestock breeding is no longer sustainable globally," he explained. "For example, to get the same amount of calories from food, cattle breeding requires 70 times more soil than what would be needed to grow fruit and vegetables," he added. "Furthermore, cattle use around 30 per cent of the global arable land, and more than 25 per cent of the world's fresh water." "If we continue with the current system, in the future there will be little chance of having the resources to distribute food to everyone." he continued. "It is for these reasons that finding another way of producing healthy and economical food that contains all the fundamental nutrients will help us to better manage our planet's food resources." The food produced via this technology can also be sterilised and packaged to be stored and transported to inaccessible areas. Scionti is also researching how to incorporate specific drugs into food products to help the areas of the world where endemic diseases are present. Elzelinde van Doleweerd also used 3D printing to create food products. The Eindhoven University of Technology graduate teamed up with a China-based technology company to print food products from leftover food, including crunchy cracker-like samples made from purple sweet potatoes and rice.